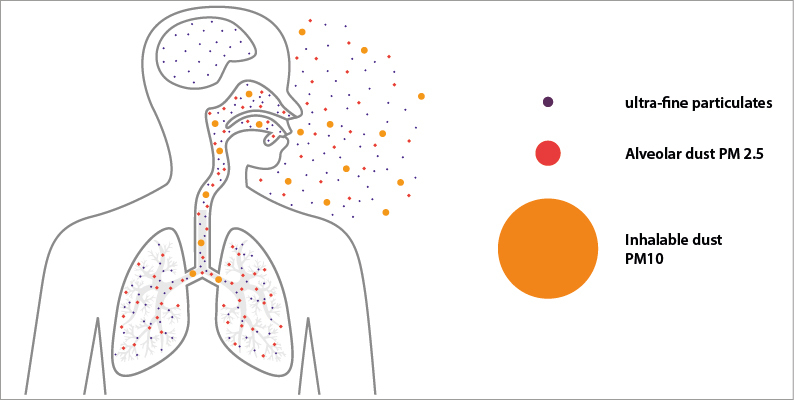 Ultrafine particles: How do the get into the human body? 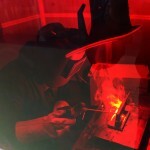 During welding, ultrafine particles are created which are breathed in or swallowed by welders. The smallest particles often cause the greatest damage. Yet, how exactly do these ultrafine particles affect the welder? And what kind of defense mechanism does the human body have? 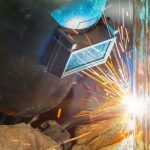 The majority of particles in welding fumes are ultrafine (ultrafine is in this context a further grading of respirable). Particles less than 0.1 microns in size are classed as ultrafine. Due to their small size, they can reach the finest parts of the lung as part of the air we breathe. There, they can cause inflammatory responses and then reach the bloodstream through which they spread in the body and infect other organs. The effect of ultrafine particles on the human body depends mainly on their chemical composition, shape, size, surface texture and other factors. Ultrafine particles can get into the body via several “entrances”. Studies on titan and zinc oxide have so far not been able to prove that ultrafine particles of less than 0.1 micron in size can penetrate healthy skin. This is mostly due to the relatively thick top layer of human skin which consists of a so-called keratinized cell layer. However, there are some indications that ultrafine particles can accumulate in the skin pockets of hair roots. These open during hair growth which allows particles to penetrate deeper layers. If the skin is damaged by sunburn or ill (e.g. due to psoriasis), then its barrier function is no longer guaranteed. Ultrafine particles can then penetrate the skin. Perhaps the most common form of absorption of ultrafine particles during welding is through the respiratory tract. Our lungs consists of two functional areas: the respiratory tract and the gaseous exchange area (bronchial tubes, bronchioles, alveoli). The air is transported in and out of the lung via the respiratory tract and oxygen and carbon dioxide are exchanged with the environment in the gaseous exchange. While the respiratory tract, protected by a layer of mucus, serves as a rather robust barrier, the barrier in the gas exchange area is only very thin. The following protective mechanisms are in play here: The respiratory tract has a ciliated epithelium with a mucus layer which allows particles to be expelled. Macrophages (scavenger cells) in the alveoli (air sacs) destroy the particles. The problem: Ultrafine particles are so small that macrophages often do not detect them and thus they remain in the air sacs – often for several months. As a result, this may lead to inflammation and the particles can then get into the bloodstream. The air on the inside of the air sacs are only separated from the flowing blood by a few nanometers – ultrafine particles can overcome this air-blood tissue barrier. The following thus applies to ultrafine particles: The smaller they are, the deeper they can reach into the lungs, thus making them particularly dangerous for the body. 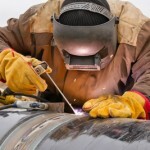 Without effective extraction technology, welders run the risk of developing fibrosis of the lungs. Furthermore, existing lung diseases, e.g. Asthma or chronic bronchitis, can become worse. Ultrafine particles can be swallowed with food or even due to unconscious swallowing, when they are expelled from the lower respiratory tract. The effect of ultrafine particles in the gastrointestinal tract is, however, unclear, especially since several animal tests have come to different results. There are indications that the particles do not pass through into the intestinal wall after absorption and are excreted again relatively quickly. In some cases, ultrafine particles have reached the blood vessel system via the gastrointestinal tract, resulting in an accumulation in other organs such as the liver and kidneys. Are ultrafine particles directly carcinogenic? The question regarding the carcinogenic effect of ultrafine particles cannot be answered definitively based on the research available today. Animal tests on rats have provided first indications of a carcinogenic effect. As part of a study, rats were exposed to high doses of nanodust which lead to an increase in tumors. It is not clear, however, if the result is a direct genotoxic effect of the ultrafine particles or if it is caused by secondary consequences. Furthermore, the data obtained is only transferable to a limited degree to people exposed to these particles.